Marth Fire Emblem Heroes is a prince of Altea, the real son of king Cornlius. Indirect descendant of hero Anri. He wields the divine blade Falchion with the ultimate task of using it to strike down Medeus the dragon of shadows. From the start of War of Shadows, he had taken refuge in Talys for 2 years before disbanding and to army to strike down and resist the grip of the empire Archanea. 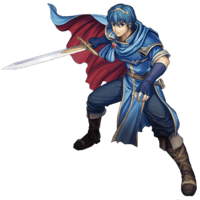 Though his courage across the wars, Marth Fire Emblem Heroes developed a reputation as a legendary hero. Believed by many people that he was the true leader to rule and lead the Archanea to salvation.